2011 Festival Tickets Now on Sale! the Gifts that Give Back! Click here to see how you can give a green gift. after-school program or group of friends sailing with Clearwater in 2011.
sails with teamwork, deploy the fishing net, and sing shanties. Students are guided through inquiry-based learning stations to examine the day's catch, perform water quality tests, learn about the Hudson's rich history, and help navigate the sloop. Clearwater recently hosted a film crew during its last week in the water in October, just before haul out. 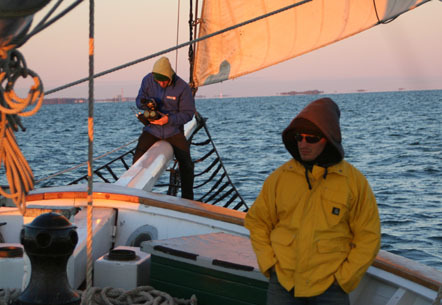 The film crew from Arena Films documented the sloop as part of a series of 3-D projects being produced for the Discovery Channel and a new 3-D network. During the film crew's three days aboard the sloop, they experienced firsthand our educational programs in the company of girl scouts, international students and groups ranging in age from 4th grade through college. The film crew also visited Beacon, NY to interview Pete Seeger. "It was extremely inspiring to meet Pete Seeger at his house overlooking the Hudson," said Nick Goldfarb, producer, "Pete has so many great stories to tell. He shared the age-old lessons that he hoped would live on in new technology, and carry forward his legacy to the kids of the future. It is obvious that his goal is to burnish and protect the legacy of Clearwater." The special 3-D project called, "Tall Ships of New York, Ships of the Hudson River", also features regional vessels fishing schoonerLettie G. Howard, Fireboat John J. Harvey, and topsail schoonerClipper City. Goldfarb and his partner Jeb Weintrob, both documentarians and early adopters of stereoscopic 3-D, conceived and pitched the 10 part series to Discovery Channel for a new 3-D channel debuting in early 2011. Every year in early November Clearwaterundergoes her annual haul out and Coast Guard inspection. Click here to see photos and read Captain Samantha Heyman - Hicks recent Captain's Log about the sloop's haul out at Norwalk Cove Marina with "a quick haul and splash and a good spot on the hard to get our work done." The sloop passed the Coast Guard inspection with flying colors and received fresh coats of paint after scraping and sanding off the old copper bottom paint in preparation for a full refinishing of her hull. Many thanks for the new environmentally responsible bottom paint from our friends at E-Paint in Falmouth, Massachusetts. Clearwater is now in her winter home with our friends at Lynch's Marina in Saugerties, NY. Be sure and watch for the dates of our Open Boat parties this winter, with live music, food and tours of the sloop. with Charity Navigator, America's largest and most-utilized independent evaluator of charities, for its sound fiscal management. 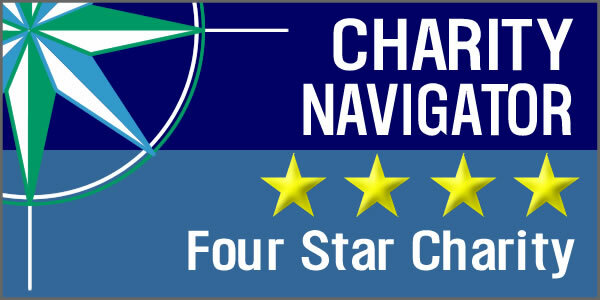 A 4-star rating from Charity Navigator is their highest rating and this achievement speaks volumes for the Clearwater's financial acumen and accomplishments made in recent years. "It is important for our members and donors to have confidence in our fiscal management and stewardship," said Heidi Kitlas, Development Director for Clearwater. "As an organization, Clearwater is honored to receive this significant recognition." Charity Navigator's mission is to advance a more efficient and responsive philanthropic marketplace by evaluating the financial health of over 5,500 in the United States. As America's premier independent charity evaluator, Charity Navigator is highly respected for its evaluation process and a regarded as a key resource for potential donors nationwide in making informed choices in their giving practices. Charity Navigator posts its evaluations on its website,www.charitynavigator.org. The service is free, and the site is navigable by charity name, location or type of activity. Charity Navigator is a 501(c)(3) organization that accepts no advertising or donations from the organizations it evaluates. Click here to view Hudson River Sloop Clearwater's review on Charity Navigator website. Tom Winslow was one of the original Clearwater crew members and Sloop Singers. He died on October 23 at the age of 69 due to complications from a stroke. Winslow is known for writing, "Hey Looka Yonder (It's the Clearwater)," a fundraising anthem for the construction of the sloop Clearwater that appeared on the album "Tom Winslow" in 1969 on Biograph Records. After moving to upstate New York from his native North Carolina in the early 1960s, Winslow met Pete Seeger at a concert in Albany and joined the fundraising effort to build the sloop Clearwater. Before the sloop was ever launched, music was the foundation of Clearwater. Pete Seeger and his supporters raised the first few dollars for the sloop's construction by performing songs about the river and passing around a banjo to collect donations. Click here to listen to Winslow performing "Hey Looka Yonder (Its the Clearwater)." Winslow performed many times with Pete Seeger and recently performed onstage with his daughter Thomasina Winslow at the 2010 Clearwater Festival and Hudson River Revival. Winslow is the father of Gary Winslow, also a notable performing artist. During the 1960s, Winslow traveled the country playing at festivals and clubs and serving as artist in residence at colleges and universities where he conducted workshops in folk and acoustic blues. During that time he quickly changed his musical focus to "human activism," including civil rights and environmental causes. Jeff Rumpf, Executive Director of Hudson River Sloop Clearwater, Paul Gallay, Executive Director of Riverkeeper, and Ned Sullivan, President of Scenic Hudson will each provide a personal message on current environmental issues relevant to the Hudson River Valley on a rotating basis. The environmental statements are updated each Friday morning and available 24/7. To listen to the most recent installment, click here. Three major environmental organizations in the Hudson Valley are teaming up with MidHudsonNews.com to provide a weekly Internet Radio report on environmental issues affecting the region. The program, "Your Environment," is accessible by clicking on a link found on the home page of MidHudsonNews website and features an on-demand audio statement.